Older mice who are surgically joined with young mice in order to share a common bloodstream get stronger and healthier, making parabiosis one of the hottest topics in age research. Publishing in Nature Metabolism, researchers from the Buck Institute report that MANF (mesencephalic astrocyte-derived neurotrophic factor) is one of the factors responsible for rejuvenating the transfused older mice. Researchers also show the naturally-occurring, evolutionarily-conserved repair mechanism protects against liver damage in aging mice and extends lifespan in flies. While researchers have yet to understand why MANF levels decrease with age, Jasper says MANF deficiency has obvious hallmarks. Flies genetically engineered to express less MANF suffered from increased inflammation and shorter lifespans. MANF-deficient mice had increased inflammation in many tissues as well as progressive liver damage and fatty liver disease. Older mice who shared blood with MANF-deficient younger mice did not benefit from the transfusion of young blood. Buck postdoctoral fellows Pedro Sousa-Victor, PhD, and Joana Neves, PhD, were co-leaders of the study. They zeroed in on MANF and its impact on the liver and metabolism. They found that liver rejuvenation spurred by parabiosis was dependent on MANF. 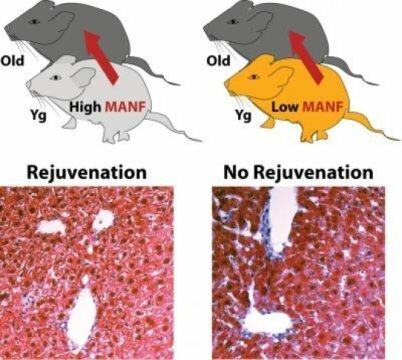 In addition, they showed that supplementing MANF in aging mice slowed liver aging, prevented fatty liver disease in animals on a high fat diet and improved age-related metabolic dysfunction.